Exclusive Invitation for ½ Off Your Design Fees! Make Your Reservation Today* Take advantage of this Limited Time Exclusive Invitation for ½ Off Design Fees and register through the short contact form below. Remember to enter your Exclusive Invitation Code. Reserve your appointment today to begin building the home of your dreams. 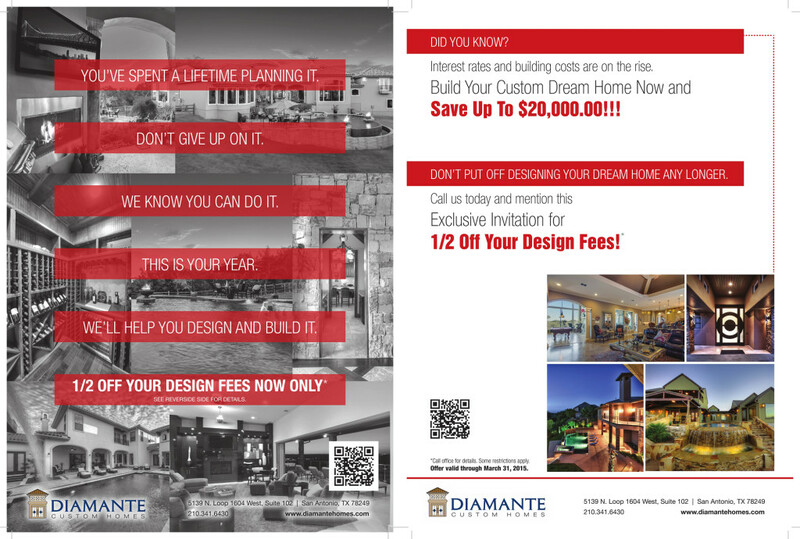 This Exclusive Offer through Diamante Custom Homes is only available for a limited time only while space and time last. Reserve your appointment today! Make this Your Year and start Designing and Building the home of your Dreams*. All fields are required. *Limited Time Advertisement only. Some restrictions apply. Offer valid through March 31, 2015.